In March 2008 I worked with Nato Thompson and Creative Time from New York City to organize a massive research project to document local socially and politically engaged cultural work going on in five cities throughout the US. We came up with five questions that we hoped would capture the diversity of ideological, methodological, organizational, economic and aesthetic approached that were occuring presently throughout the country. It was our hope to develop a format that would allow future audiences to compare the work happening between these cities. These “Town Hall Talks” took place in Baltimore (@ 2640 community space), Chicago (@ The Experimental Station), Brooklyn (@ The Change You Want To See Gallery), LA (@ Los Angeles Contemporary Exhibitions), and New Orleans (@ The Community Book Center). One hundred artists, curators, educators and activists were interviewed in this project. This essay (below) was recently published in “A Guide to Democracy In America” from Creative Time Books (2008, Ed. Nato Thompson). The version in the book was edited down to be shorter and lost some clarity, so I am including the longer version. The essay is an introduction to over 50 pages of edited transcripts from the Town Hall Talks organized by Nato Thompson and I to accompany his “Democracy in America” exhibition and event series throughout 2008. To read the unedited transcripts from these meetings, you can check them out online (where you can also order a “print-on-demand” bound copy of the transcripts). The impetus for a series of Town Hall Talks comes out of a belief and observation that many cities in the United States have produced robust infrastructures for art and activism. These local examples need to be documented and discussed widely to glean information on art and activism models and practices operating in relation to regional concerns. While some theorists of capitalist globalization suggest that homogenization is occurring in global urban locales – examination of these cultural practices reveal many particularities to local contexts as seen in Baltimore, Chicago, Los Angeles, New Orleans and New York City. 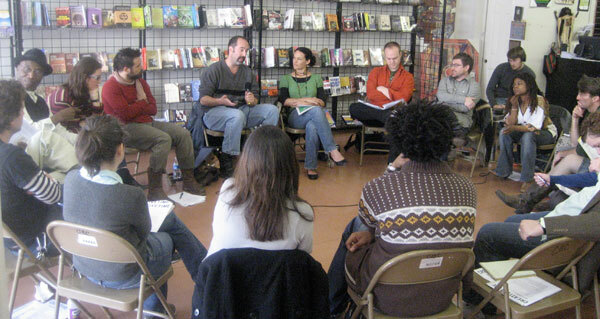 Following the explosion of energy in the “Counter-Globalization Movement” of the late 1990s/early 2000s where everyday people across the world were educating themselves about the global production chains effecting everything from manufacturing to food and elite education, there appeared to be a pragmatic turn towards the local. * This turn is demonstrated in the work happening in these cities – practices that directly interrogate and are integrated within the fabric of a place. Their unique characteristics can prevent them from being interpreted in relationship to one another and prevent them from being seen on the popular art radar. In highlighting these forms, we hope to strengthen the much-needed critical art community by sharing models and by encouraging potential networks of critical artistic practice. As a follow up to the 2005 “Who Cares” initiative sponsored by Creative Time that set out to discuss artists’ reactions to the current political climate through three by-invitation dinners, the Town Hall Talks jump off from New York City into other urban contexts. The four other cities chosen were selected because they demonstrate a range of practices that would be productive in conversation with each other. We hope that each conversation raises complicated questions in regards to what constitutes a effective and engaging political art practice. Each conversation took place in March 2005 and was organized and moderated by Nato Thompson and myself. Each meeting was hosted by a local organization and consisted of a single four hour long discussion broken into three parts: the first part consisting of Nato and I introducing the talks and the goals behind them, the second part consisted of artists sharing local models and strategies that have been successful, and the final third section involved considering how to best organize locally focused efforts nationally and beyond. To be frank, these gatherings were closer to a Town Hall Focus Group than a Town Hall Talk. There were no fliers posted on busy street corners or even emails calling for open participation – there were no broadsides nailed to the outer doors of the “town hall.” These meetings were closed and participation was invitation only. This was motivated primarily by the goal of having a publication-worthy transcript that would extend the life of the conversation beyond the initial gathering. This was informed by past experiences with large gatherings that were difficult to moderate and easily dominated by a few loud individuals. While large public events can be very meaningful and can catalyze conversations and socializing that is beneficial to the local context – we wanted to be true to our goal of documenting local practices in an attempt to take that snapshot of a moment in time to share with audiences in other regions. The participants were invited based on combination of factors and criteria. We wanted to privilege age, gender, and racial diversity yet avoid asking questions that specifically addressed that diversity because all too often it is either not on the table at all or it is the only topic explored. We wanted to find individuals whose practices, aesthetics and ideologies differed significantly – in order to represent the diversity of approaches that are found in that place. And finally, we wanted to have participants who practiced their art in close proximity to social movements, community participation or progressive politics. We wanted them to have practices that could be read as being locally oriented and in some cases involving long-term engagement and process, as we were interested in highlighting work that was difficult to represent or catalog in the published or exhibited forums typically afforded to contemporary art. In order to achieve a form of documentation that was suitable to publishing and would allow all participants equal participation we developed a fairly strict method for executing each Town Hall Talks [THT]. We were convinced that more people would find the documentation useful if it was executed in an interview format, as it can be quite hard to follow a less structured discussion in transcript form. This is another reason why it was like a focus group – because the terms of the participation were fairly rigid and predetermined. Five questions were conceived of and then circulated to all participants prior to their attendance of the meeting. Then each participant was invited to respond to no less than one and no more than three of the questions with each response being subject to a three minute time-limit. The responses to the questions were spoken in rotation, with gradual priority given to those who had not responded to previous questions. The participants were reminded that their role was unique, and that their responses should also attempt to articulate the broader concerns of their peers, collaborating organizations and communities – since they were at the meeting and others were not. This “representational” or “spokesperson” role is not a common position that artists are asked to occupy, but it is common in politics and is something we wanted to emulate in order to encourage a serious reflection on the broader context in which these artists were working. In circles that practice “direct democracy” this form would be called a spokes-council. The set up was a bit risky, with methods and tactics borrowed from town hall meetings, progressive activist group-process, sociology and crowd-sourcing market research – then introduced to a collection of artists who don’t necessarily know each other or the moderators, and who may have never given interviews – much less a group interview! And to add a bit more chaos in the mix – the five city’s meetings were visited and gathered over the course of twelve days with the two moderators traveling from one city to the next with a suitcase full of recording equipment. But somehow, it worked. 1. Who is your audience and how does your work mobilize them toward strategic local concerns? 2. Given that the ways we make money impacts the type of culture we produce, how does the local economy effect your art practice? How do you work to obtain and share resources? 3. Describe a local cultural event that productively expanded the social networks that your practice operates in? That is to say, the event produced a new sense of community that had political potential. 4. As a politically engaged artist or organization how does your practice relate to existing social movements? 5. These conversations come out of a nation-wide concern about the fate of democracy. How do you see your projects tying into a larger national structure? Is organizing nationally productive? What are its limitations? What do I mean when I say it worked? Well, 100 artists in five cities got a chance to discuss their work and ideas through the lens of five broad questions that were intended to shed light on the existence of shared and differing conditions and concerns. The work being produced in these various traditions and contexts stands to gain a lot by being discussed together, yet we tend not to cross-over as much as we would like and are generally comfortable shaping our own highly specific niche market communities. The THT created a shared context amongst very diverse practices from youth media and local zines; to everyday-life-plop-art and long term community collaborations; to theater and story-telling performances; to interventions and conceptual art that can be read in relationship together – all articulating a spectrum of interrelated practices. The technical outcome involves a multi-faceted distribution process, including this book, in which the content of these transcripts will also circulate to diverse audiences via a website, and printing in various local publications in the cities where the THT occurred. But really, what happened? And where can it go? We were granted unique access into the spaces and communities that produce profound ideas about how culture works in relationship to politics and social life. The questions that the THT participants are responding to were carefully conceived of to inspire answers that would illustrate the artist’s environment, history and ideas. These practices are difficult to account for in simple documentation or exhibition, and these questions explain how and why people do this work. Producing a THT makes discussions in and of themselves, it facilitates the distribution of ideas, it historicizes a moment in time and a wide range of ways of working. But can those different ways of working be productively expanded when put in conversation? Can they be literally networked or coordinated? Or are they simply symbolically connected through their representation on the same pages? What would a network of socially engaged artists look like and what would it do? The individuals and practices represented in the THT transcripts are inspiring, no doubt. The difficult and challenging labor involved in working as an artist in relation to activists dealing with the most pressing issues of our time – speculative local/global economies, mass incarceration, ecological devastation, and the suppression of culture – produces near insurmountable questions about the capacity of art to change the world. And all of the people who spoke in these meetings are pressing up against those challenges every day. They are the answer to the often asked and always vague questions of “how can artists do politics?”; “can political art be beautiful?”; “what is the ROLE of the artist today?”. These artists are providing us all with better questions. As these questions get refined and evolve, a new question arises for me: What would a network of socially engaged artists look like and what would it do? Because if the questions are really going to be pushed and circulate widely, and if people are going to feel accountable for asking them diligently and effectively – then some kind of organizational apparatus for coordinating the language and methods of evaluation is going to be necessary. Very few young artists, or leftists for that matter, have a sense of what it means or feels like to participate in a coordinated large scale organization. But there are precedents for artists getting organized. Throughout the country (and internationally) there are examples of artist collectives and networks with explicit political goals. In Chicago, where I am based, we had a local incarnation of the John Reed Club in the 1920s; in the 1960s there was the Afri-COBRA group, which brought together artists aligned with black power and black liberation work. In New York City in 1982 there was the February 26th Movement which was a weekend long conference intended to network activist-artists from throughout the country (2). And currently cities throughout Europe from Copenhagen to Zagreb are forming professional trade union like organizations and networks that are explicitly connected to critical contemporary art (3). Talking about an idea of coordination and realizing it are two very different things, as it is not uncommon to talk of the “fragmentation” of social and political life today. Artists, like anyone, are faced with serious obstacles in coming together to form a political organization (4). There are three significant factors that impede the coordination of artists in the U.S. from developing coordinated efforts to change dominant forms of political and social organization . Those factors are the dominance of subcultures and social networks over other forms of organization (5); a general fear of ideology from self identified progressives; and the entrenchment of our labor in non-profit organizations and other structures that serve to depoliticize our work (6). There are a great many challenges to artists “getting organized” to work together on common projects or even in support of common ideals. Through initiating the THT project, we hoped to ask the questions that would be necessary pre-requisites to imagining what an artist organization that is politically progressive would look like. We also hoped to ask questions to find out what questions might better address the general concern about the potential for cultural work to influence and impact politics – and to address the impediments that currently exist to doing so. The THT participants and their responses to these questions give us the fodder to ask better questions in the future. They show us the diverse terms by which an artist today can act and self-identify as socially engaged and politically relevant. They show us the complex web of organizational forms which those artists can take and gather under. And they reveal that the place from which we are starting is not unified, and that aesthetic, cultural, geographic and economic differences are as challenging as ever to translate from place to place or person to person. This diversity can be a strength in the future, but it will require the identification of some terms, goals and structures which we can share. * “the local”: From ecology to public space to gentrification – activists have turned their attention to the local scale, often citing the ability to witness faster results and/or an intimidation with larger regions or national spaces. This “localism” is not inherently naive or ignorant of the necessity of a structural and international analysis. It could be seen to be a reaction to the crisis of the left following the dissolution of any coherent or powerful organization or as a pragmatic response to the limitations of international solidarity and Internet activism. 1) For a more serious investigation of these issues, read “The Big Sort” by Bill Bishop (Houghton Mifflin 2008). Bishop argues that Americans have been sorting themselves into ideological homogeneous communities for the last thirty years. 2) For more information on February 26th Movement see “Collectography of Political Art Documentation and Distribution: A 1980’s Activist Art and Networking Collective ” by Greg Sholette, available through http://gregorysholette.com/writings/writing_index.html (accessed June 20th, 2008). 3) Union of Young Art Workers (UKK) (http://ukk.dk) in Copenhagen and Zagreb Cultural Kapital of Europe 3000 (http://culturalkapital.org). 4) This section is an edited excerpt of the essay “Getting To Know Your City and the Social Movements that call it home” by Daniel Tucker for inthemiddleofawhirlwind.info edited by Team Colors and published online by the Journal of Aesthetics and Protest Press. 5) “The Big Sort” by Bill Bishop (Houghton Mifflin 2008) provides data on how Americans have fallen into niche-market social and political life. 6) The Revolution Will Not Be Funded: Beyond the Non-Profit Industrial Complex, Edited by Incite! Women of Color Against Violence (South End Press, 2007).